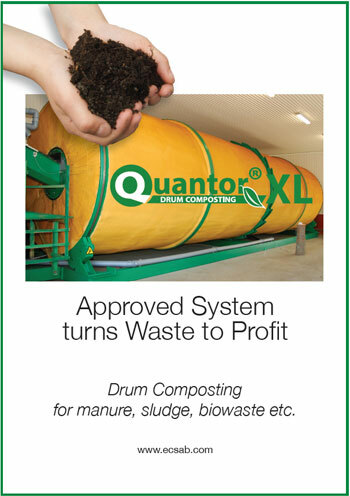 QuantorXL® Drum Composting System fulfills EU regulations for animal by-products, for composting manure, and is approved by the Swedish board of agriculture through validation. 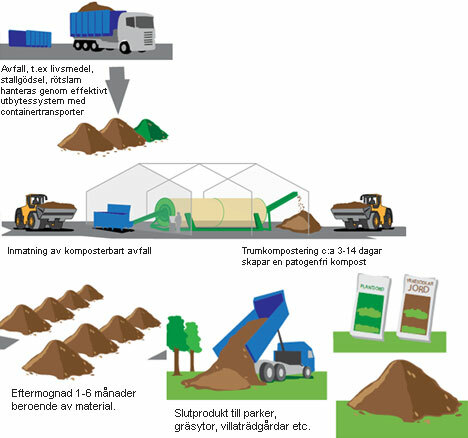 Manure is currently the most heavily regulated waste type in Sweden. A number of parameters in the QuantorXL® Composting System are considered but the most critical requirement is that for hygienization, i.e. the complete elimination of potential pathogens and parasites. QuantorXL® has been validated to achieve full hygienization when all the material in the composting drum reaches a minimum temperature of 52°C for at least 13 hours without interruption. How does QuantorXL® achieve this? 1. Oxygen supply is good throughout the process and in the entire compost mass. 2. Mixing of material is effective and provides an optimal distribution of active microorganisms, and facilitates the aeration further. 3. Temperature can be controlled and kept at the desired level, with no cold zones. For QuantorXL®, thanks to the efficient process, there is no requirement for specific particle size. 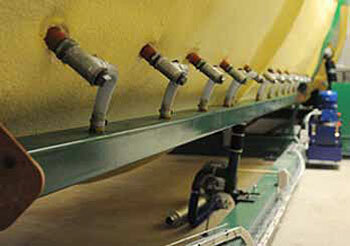 This saves time and energy compared to other methods, where extra processing may be required. What benefits come with the approval? QuantorXL ® composting plant is system approved and certified. All that needs to be done is to obtain approval for the handling and surrounding operation. Then you can receive all types of organic material for composting and have a complete solution for all types of waste. You do not need to decline any waste, such as manure, and so different types of materials can be mixed according to your needs, to provide an optimal process and end product. Nutrient-rich material can, and should be included, to give the compost the best possible value. - Horse breeders and Equestrian facilities. - Farms with large scale animal production. - Entrepreneurs creating a business, by first offering a solution of a waste problem to, for example, food wholesalers or stables in urban areas, and then also being able to sell the final product. - Municipalities that today do not have an adequate management for all waste, or use plants elsewhere, resulting in unnecessary transports. - Composting plants that do not have approved systems for all types of waste. QuantorXL® can be integrated with the existing systems to add a quick initial hygienization, or be used for certain parts of the waste. - Soil producers wanting to secure access and control over an important raw material. - Biogas plants that want a supplement for difficult waste or to use when disruptions occur. To be efficient in commercial composting you need to reach a certain scale. However, in systems with too large volumes of waste, focus is often more on the actual handling rather than on controlling the process to create a good end product. With QuantorXL® the composting takes place in a closed container, under full control. The volume of the QuantorXL® drum is 125 cubic meters which is optimal in order to achieve the right flow and time in the drum, so that the best conditions for composting are achieved. Treatment capacity for QuantorXL® varies with the material. For manure, for example, it is approximately 10 000 m³ per year, whereas other waste may require more time in the drum, resulting in lower total capacity. If there is a need for larger volumes, a plant can have several, parallel drums. What happens in the drum? The composting process starts when oxygen-consuming microbes generate heat. Other microbes, adapted to heat, enter and start the decomposition of the material. In QuantorXL® the temperature stays between 52-70 °C, when the waste mix is correct. This allows highest possible rate of degradation and the active microbes operate at maximum efficiency without interruption. At this temperature all microorganisms that are not adapted to heat, including pathogens and parasites, die. Also weed seeds loose their ability to grow. Composting in QuantorXL® requires no additional heating, but the rotation and associated mechanics require some energy. The electricity consumption of a complete plant with one drum is around 20,000 kWh for one year in continuous operation . At the same time excess heat from the composting in one drum is around 100,000 kWh per year at optimal process. This energy could be recycled and used to heat nearby buildings. A QuantorXL® Drum composting system is fully automated and consists of a receiving container for waste and structural materials, a complete feeding- and discharge systems, and the composting drum. In the process, material is continuously passing through, i.e. not in batches. The workload is about one hour a day, receiving material, creating a good mix with structural material, checking moistness and filling the feeding system. The amount of preparatory work depends on the desired composition of the end product, and its area of use. The actual composting takes place inside the rotating drum, which is insulated and aerated by a fan. No addition of chemicals or other matter is required. The plant is reliable and easy to manage, and the process can be easily monitored, optionally by remote control. Thanks to the automated system no staff or machinery need to work in the compost during the main process, when conditions otherwise wear heavily on both people and equipment. The temperature in the drum stays between 52-70 °C depending on the composition of the material. Time in the drum is determined by waste type, where, for example, horse manure can be processed relatively quickly while other types of waste may require more time. It also depends on if you primarily want a quick hygienization of the material, or choose to let a greater part of the composting take place within the drum. The material is degraded into a clean compost which is free from harmful bacteria, viruses, weeds and odour. The volume of the material has meanwhile been reduced to around 70 percent of the input volume. Finally the compost is left to mature during one to six months before it is used for further processing.